Investing In Palladium | Why Buy Palladium? Record high palladium prices may be here to stay for some time to come. Now threatening to match the price of gold, learn why we humans value palladium so much and how hard it is to find these days. Learn how recently palladium was worth 4Xs gold’s price and 2Xs platinum’s price and how one car manufacturer lost $1 billion USD buying it. Which 2 countries mine 75% of palladium? Get your critical palladium supply and demand facts right here. Palladium bullion as an investment is a relatively new phenomenon especially when compared to the multi thousand year adornment and monetary history of silver or gold. 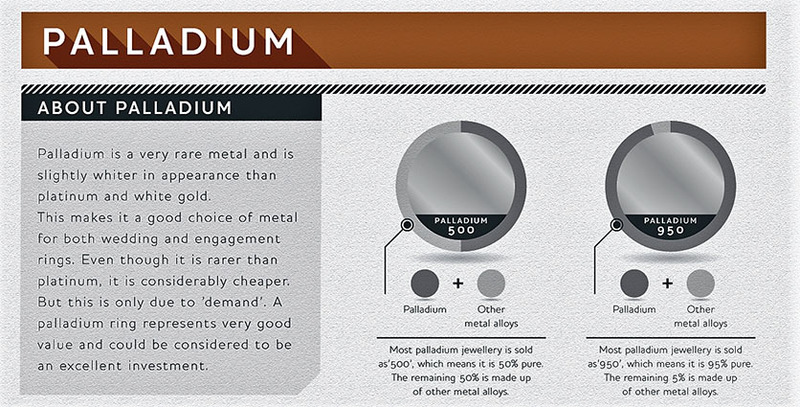 Let us begin with a brief recap of palladium investment fundamentals. For various durations of time (e.g. 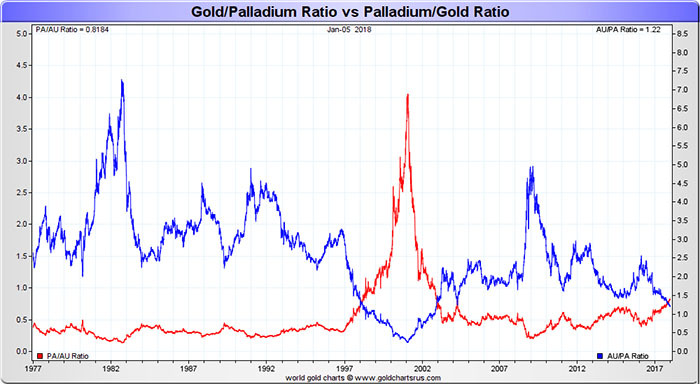 1997 - 2003), palladium has sold at price premiums higher than gold and again recently platinum. 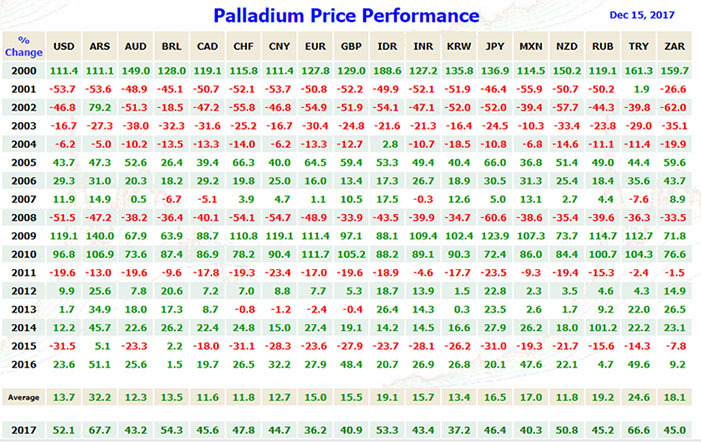 At the moment, palladium is valued higher than platinum and may potentially pass the price of gold if trends continue. 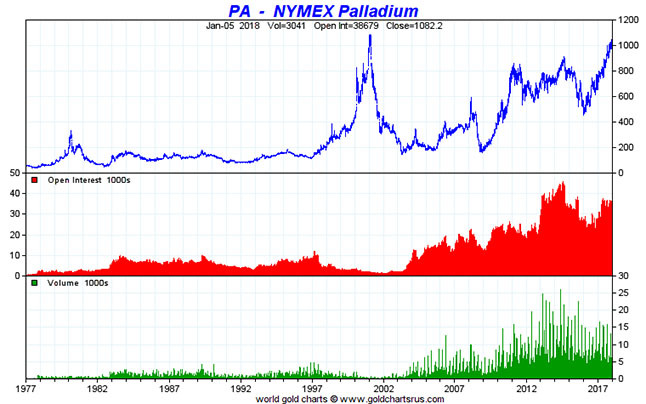 On January 26, 2001 palladium hit its former all time price record near the end of the Dot-com bubble era. Palladium’s $1,094 oz USD London AM fix price in early 2001 was the result of a supply shortage exacerbated by Russia (one of this precious metals’ main miners). That same morning in early 2001, palladium was priced more than 4 times the London AM gold fix ($264.50 oz USD), almost 2 times the AM platinum fix ($616 oz USD), and over 225 times that day’s silver price fix ($4.78 oz USD). Today palladium is again hitting all time price highs but for different supply shortage reasons. Notice in the chart below the rampant run up in NYMEX open interest and trading volumes especially since the collapse of its last 2001 price mania. This year of 2019 should be very interesting for palladium prices. A runaway palladium price is looking technically and fundamentally possible. 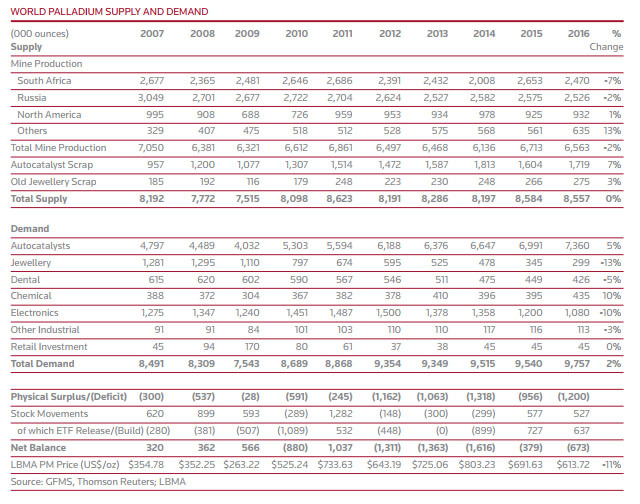 Any mine supply disruptions in Russia or South Africa could exacerbate the shrinking supply situation. Expect at current and higher palladium prices to begin seeing car manufacturers switch back to platinum use in catalytic converters (Volkswagen scandal aside). Palladium is a highly rare precious metal with even smaller above ground physical supplies than silver, gold, and even platinum. With an Earth's crust concentration of 0.015 parts per million (ppm), palladium is over five times more rare in the ground than silver (found at 0.075 ppm). Platinum is still three times more rare than palladium in the ground found at 0.005 ppm, while gold is the most rare of the 4 precious metals cover here with an estimated 0.004 ppm in the Earth. To give you a more understandable perspective of how rare palladium is, if we converted palladium’s parts per million rarity into time, we would only find 1 minute of palladium in just over 125 years time. For gold it would be more than 450 years, platinum over 380 years, and for silver 25 years to 1 minute of respective precious metal recovery. Whilst gold is nearly 4 times more rare in the ground than palladium, human beings have been mining gold for many millennia. Palladium was only scientifically discovered somewhat recently in 1802 AD, due to its very high melt point ( 2,831°F / 1,555°C ). Prior alchemists beforehand were not able to achieve fires hot enough to easily melt, refine, and solely isolate palladium and therefore appreciate its unique elemental qualities. New world explorers of the 15th to 17th centuries regarded palladium (and other high melt point noble precious metals like platinum) as low value annoyances in their quest to find new supplies of silver and gold in the Americas and elsewhere. Historic mining data shows just over 6,000 tonnes of palladium have ever been mined. Throughout history about 250 times more silver and 30 times more gold have been mined compared to palladium. The element palladium is extraordinary resistant to wear, tarnish, and corrosion. Palladium is also a very malleable and ductile metal able to be hammered into fine sheets or stretched into a very fine wire without fracture thus it is both useful and easy to work with for many fine jewelers and artisans. Over the past decade, investment funds for palladium as an investment have increased especially since the inception of palladium exchange traded derivatives. Yet still, almost all of today’s palladium demand remains for industrial usage as we will see in the palladium demand section to follow. Since the beginning of this 21st Century, the world has witnessed a pronounced general increase in palladium’s value priced in every single national currency issued by any government worldwide. Compared to gold, the price for platinum vs fiat currencies tends to be more volatile to both the downside and upside. In other words, palladium prices are very volatile swinging sharply up and down in short time frames. Today over 75% of the world’s fresh palladium supplies are produced by just South Africa and Russia combined. About 38% of all new mined palladium supplies come from South Africa while just over 38% of the world’s current palladium mine supply comes from Russia. Both Russia and South Africa have had major palladium supply disruptions already in this 21st Century. 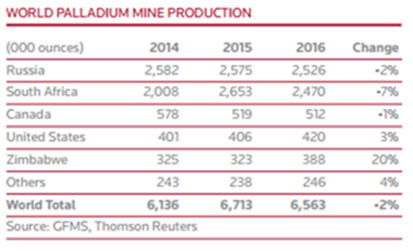 Palladium supplies (like platinum supplies as well) are considerably more vulnerable to mine production halts (e.g. labor disputes) and political disruptions when compared to other more geo-diversely mined precious metals like gold and silver. Palladium supply disruptions have often been the catalyst for sharply increasing palladium prices. Late in the year 2000, a Russian palladium supply disruption helped incite the still all time palladium price record high of nearly $1,100 USD oz reached in January 2001. This Russian caused palladium supply shortage led to the Ford Motor Company’s purchasing department to shortsightedly stockpile palladium at record high prices without prudently using futures or options contracts to properly hedge their downside palladium price risks. By early 2002, Russia was again exporting palladium supplies and the US dollar spot price of palladium fell by more than 60% from its prior year’s all time record price. As a consequence the Ford Motor Company was forced to write-off a $1 billion US dollar loss on the decreased value of the palladium stockpile its purchasing department had acquired unhedged. In 2014, South African mine strikes and political instability adversely affected palladium supply production totals helping to drive palladium prices higher. 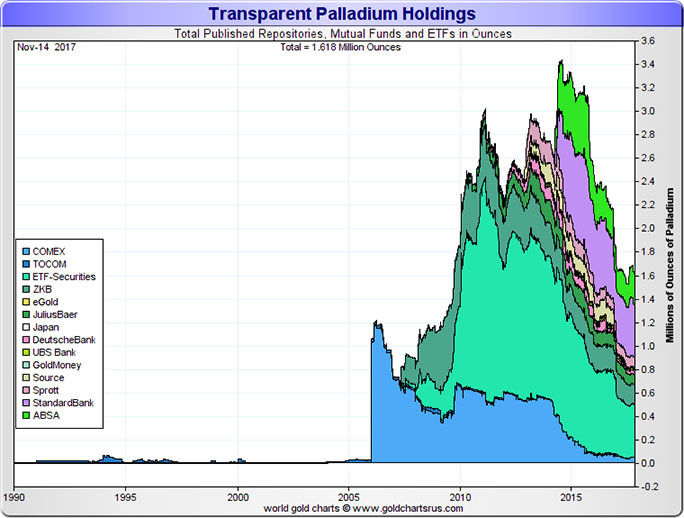 The ongoing downtrend in palladium inventories is over one decade long. Physical deficit have begun showing signs of affecting market liquidity and prices in recent months. The palladium market may become more and more susceptible to bouts of inventory tightness if palladium supply deficits persist. World palladium demand is driven by 6 primary sectors of industry. 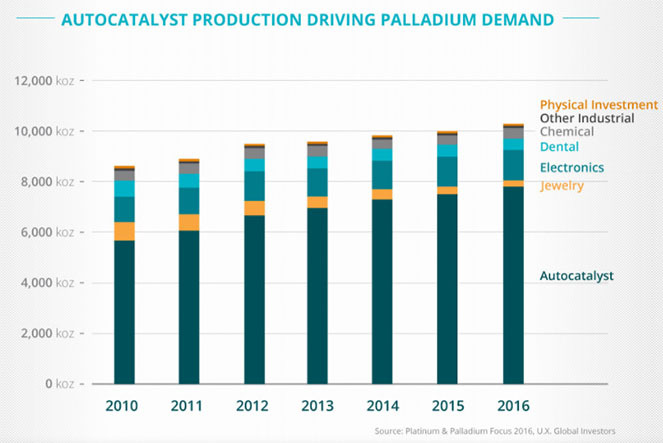 About 70% of the world’s palladium demand is for automobile catalytic converters used to reduce automobile CO2 engine emissions. Just over 10% of palladium’s annual demand comes from electrical usage in semiconductor applications, platings, and for battery fuel cells. Dental and chemical uses combines to make up just under 10% of today’s yearly global palladium demand. Palladium jewelry, investment demand, and other industrial use demand fills out the remaining 5% or so of annual palladium demand worldwide. Palladium (and platinum as well) has also become popular in artistic photography printing due to the variant coloring it offers as well as the image’s improved durability as a result of the precious metal infusion. People apparently still yearn for art which lasts. Today’s annual worldwide demand for palladium is now reaching levels just under 10 million ounces or around 300 metric tonnes per year. Below is a recent breakdown of physical palladium uses. Still the smallest segment of world palladium demand comes from the palladium investment sector itself. According to Thomson Reuters, palladium has been running consecutive annual supply deficits since the year 2007 (for a full decade now). Palladium today is more heavily used in gasoline catalytic converters. Whilst platinum is more heavily utilized in diesel engine catalytic converters, which have fallen out of favor since the Volkswagen emissions scandal of 2015. A recent factor fueling this latest rarely seeing palladium prices eclipse over platinum prices. Investment demand for palladium has risen exponentially since the inception of ETF investment vehicles. Since the 2008 Financial Crisis lows hitting below $175 USD oz palladium, there has simultaneously been a pronounced increase in palladium prices coupled with an increase in the numbers of palladium bullion items being sold to the investing public. Palladium by nature is more dense than silver therefore investment grade palladium bullion products take up much less storage space per troy ounce than silver bullion products do. If palladium continues to run further consecutive annual supply deficits (it has been since the year 2007, a full decade now), longterm palladium bullion owners may see further new record US dollar prices obtained for this precious metal. We are perhaps only a few final catalysts away (e.g. Russia or South African mine issues or other contributing macroeconomic factors) from yet another price mania ensuing for this precious metal in the years to come. Although still small in scope, it is becoming more commonplace for retail investors to buy physical palladium bullion products online and take direct ownership in order to better diversify potential risks to their wealth and investment portfolios. The US Mint has also begun supplying government guaranteed palladium bullion coins with the recent increase in palladium investment demand. Enough for now on the basic supply demand fundamentals driving the four biggest physical precious metals markets. It is time to discuss how the physical bullion industry operates in the 21st Century.